Rokiah Alavi is a Professor at the Department of Economics, International Islamic University Malaysia. 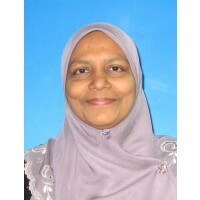 She received her Bachelor of Economics (First Class Honours) from University of Malaya in 1986. She obtained her Masters in Development Economics and her PhD from University of East Anglia, England. She has been actively involved in research, teaching and training on WTO and international trade issues. Her research interests are in the area of economics of intellectual property protection, services trade, competition policy and development economics. She was the Head of Department of Econom ... show more ics, IIUM in 2003 until 2006 and led the Globalization and WTO Unit for 10 years since 2003. She has been the trainer for the Regional Trade Policy Course organized by the WTO since 2004 until 2014 and was part of the teaching team for training programs organized by JICA, IIUM, University Malaya as well as the Malaysian National Institute of Public Administration (INTAN). She has been awarded research grants from various international organizations such as World Bank, OECD, JIPO, ICTSD, SEATCA and UNCTAD and has published few books and many articles in international journals. She is actively involved in various NGOs and local community associations.